CHIAVARI, Italy - Along with sun filled days, the ever blue Mediterranean Sea cools the soft breezes that float through my apartment. Life is easy, it’s summer in Italy. On my kitchen table there’s a big basket stacked with lemons that I bought at the market this week. 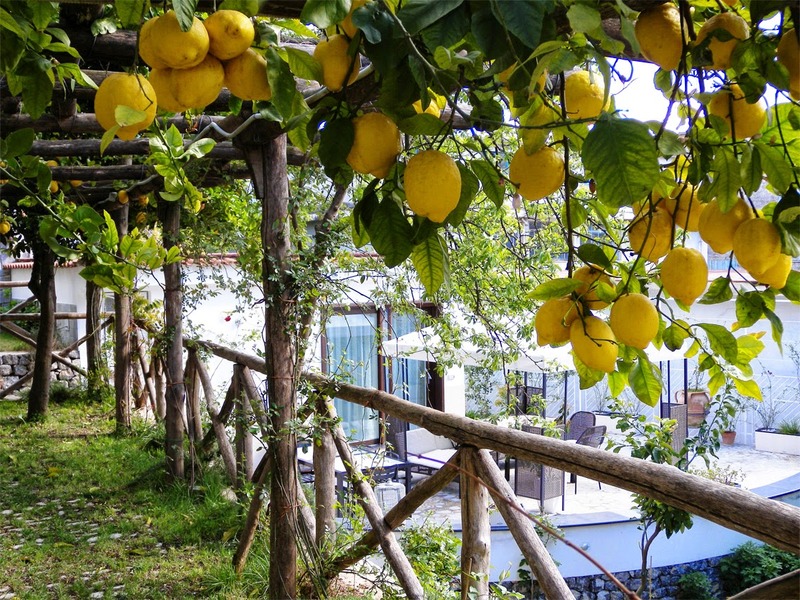 Some of the lemons are picture perfect, smooth, bright yellow ovals from Sicily. The others are twice as big, knobby and have thick mottled yellow skins. The knobby ones are called sfusati Amalfitano as they come from the Amalfi Coast. The perfect, smooth lemons from Sicily were brought to the island by the Arabs sometime around the year 948, when Hassan al-Kalbi was the Emir of Sicily. The sfusati Amalfitano, on the other hand, have a different story, a story that starts in the 11th and 12th centuries when the Maritime Republic of Amalfi was a Mediterranean naval power to be reckoned with. Of Italy’s four major Maritime Republics, Amalfi, Genoa, Pisa and Venice, tiny Amalfi was the most powerful. It was an economic powerhouse, trading textiles, spices, precious stones and fruit with countries of Africa and the Middle East. 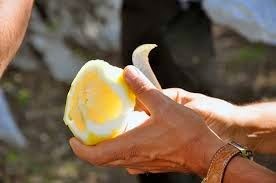 One of the fruits they imported from India were small, round and yellow and called lemoncello de India. 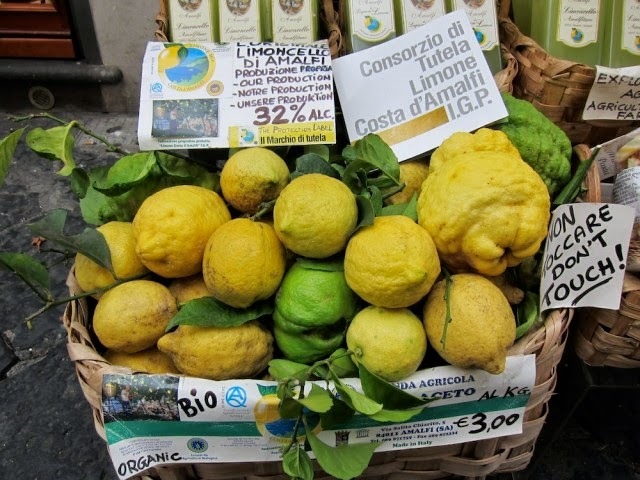 Local Almafitani farmers began to cross pollinate the lemoncello de India with cetrangoli, the bitter oranges that grew along the Amalfitano coast. Over time, centuries actually, this cross pollination resulted in the knobby yellow sfusati of Amalfi sitting in the basket on my kitchen table right now. 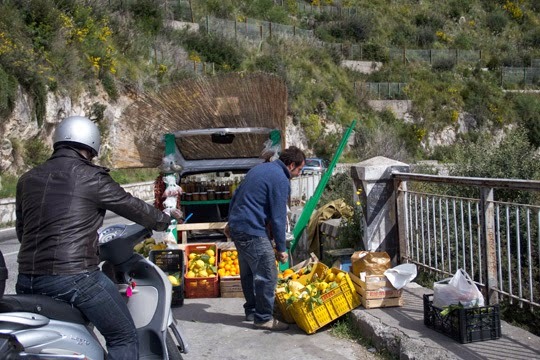 The sfusati grow on the steep terraced hills along the Tyrrhenaian Sea from Positano to Vietri sul Mare, a territory of no more than 700 acres. With their exceptional aroma and flavor, they are widely used in the local cuisine. The house specialties at Ristorante Donna Rosa in Positano include an antipasto of raw artichokes with lemon, caramelle of fresh pasta filled with lobster and lemon, and ravioli with lemon and ricotta. And it’s not just the lemon juice and pulp that is used. 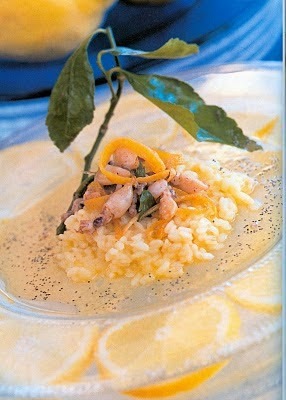 At Albergo Ristorante Bacco in Furore, they still follow the ancient tradition of cooking food in lemon leaves. Some of the dishes they offer are grilled smoked provola wrapped in lemon leaves, rabbit roasted in lemon leaves and home-made tagliolini in lemon sauce. 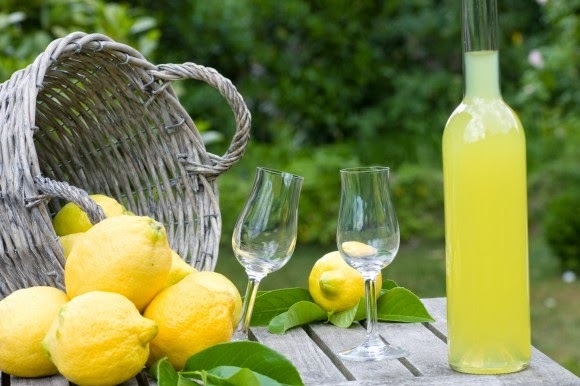 But other than being a principle ingredient in the kitchen, sfusato Amalfitano are also the basic ingredient of that delicious, sweet liqueur, limoncello that is enjoyed after dinner during the warm summer months. In surfing the web this week I found a video of Miami chef John DiRicco making limoncello in his kitchen. I liked his straight forward approach and thought you might like it too. My only point of contention with Chef DiRicco is that here in Italy small glasses of limoncello are sipped and savored after dinner, not thrown back as he does on the video but, to each his own. 2. Put the yellow peels in a jar or bottle, add 1 bottle vodka and seal tightly. Leave the bottle to steep in a dark and dry place until the peels lose their color, at least 2 weeks. 4. Strain the vodka from the peels and mix it with the remaining bottle of vodka and the syrup. Put the liqueur in bottles, seal tightly and let the components marry for at least 1 week before using. For drinking straight, store the limoncello in the freezer. Don’t fill the bottles to the top though, the limoncello needs room to expand when it’s cold. The link doesn't work but you can copy and paste to go to the page. 1. Melt 2 tablespoons butter in medium saucepan. Add oil, onion and lemon peel; cook for 2 to 3 minutes or until tender. Stir in rice; cook for 1 minute. Stir in water, wine, lemon juice, bouillon and pepper. Cover; cook gently over medium-low heat for 30 to 35 minutes. Stir in cheese; stirring occasionally. 2. Melt remaining butter in medium skillet. Cook shrimp over medium-high heat for 3 to 4 minutes or until pink. Serve shrimp over risotto; sprinkle with Gremolata. 3. For Gremolata: Combine 1 teaspoon finely chopped garlic, 1 teaspoon finely chopped fresh parsley and 1 teaspoon grated lemon peel in small bowl. Mix and serve.